Pie Five Pizza debuts new prototype in Garden City, Kansas. GARDEN CITY, Kan., Oct. 30, 2018 /PRNewswire/ -- Pie Five Pizza Co. is now serving its customizable pizzas prepared and ready to enjoy in five minutes or less in Garden City. The fast-casual restaurant opened at 1110 Fleming St. on Monday, Oct. 29. This is the first location with Pie Five's new Goldilocks Project prototype. The design features a seating area with 50 seats and sleek digital menu boards. The Garden City Pie Five will also be the first location to use the cloud-based point-of-sales system, NCR Silver. 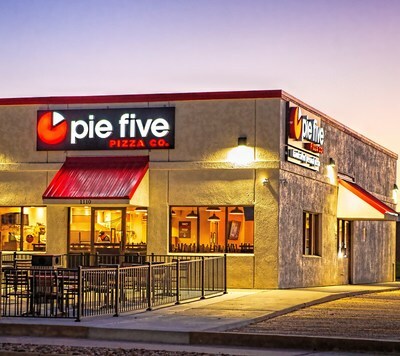 "My business partner, Tim Long, and I are excited to bring Pie Five to southwest Kansas," said Franchisee Greg Trejo. "We are in a great location in front of the Sequoyah movie theater and we have hired an amazing team who will join us in serving our customizable pizzas to everyone in Garden City. The new technology will help us improve the Pie Five experience, enabling us to become the go-to destination for fresh pizza in the area. In addition to opening our new restaurant, we are looking forward to becoming an integral part of the community." The Garden City Pie Five is the ninth location in Kansas. Open daily from 11 a.m. to 10 p.m., the restaurant also has a drive-thru, perfect for picking up pizzas for the family on busy weeknights. The menu features Pie Five's three best-selling crusts – Classic Pan, Crispy Artisan Thin and a gluten-free cauliflower crust – six sauces and 30 toppings for a delicious pairing to match every guest's preference. In addition to customizable personal and large pizzas, Pie Five also serves kids pizzas, freshly tossed salads and warm cinnamon stix dessert. Dallas-based Pie Five Pizza is a subsidiary of Rave Restaurant Group, Inc. (NASDAQ: RAVE). Rave owns, franchises and supplies approximately 300 Pie Five and Pizza Inn restaurants operating domestically and internationally. Pie Five Pizza is the leading brand in the rapidly growing fast casual pizza space, offering individual handcrafted pizzas with fresh ingredients made to order in less than five minutes. The brand was named among Fast Casual's Top "Movers & Shakers" for three consecutive years, 2015 "Best Franchise Deal" by QSR Magazine, 2012 Hot Concepts winner by Nation's Restaurant News and one of "10 Hot New Restaurant Chains from Established Brands" by Forbes.com. For more information, please visit PieFivePizza.com.